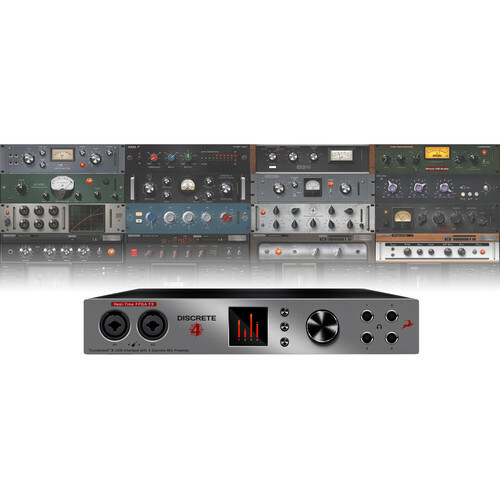 The Antelope Discrete 4 with Basic FX Pack is a Thunderbolt/USB 14x20 audio interface designed to provide high-end tracking and monitoring functions, real-time effects, and remote control capabilities for musicians and engineers in personal, project, and commercial recording studios and rehearsal spaces. It features 14 inputs, 20 outputs, a host of real-time effects and models, support for sample rates up to 192 kHz, and host connectivity via Thunderbolt and USB 2.0. Four XLR-1/4” combo jack inputs give you access to the four discrete Accusonic microphone preamps. There are also ADAT optical and S/PDIF coaxial digital inputs for accepting signal from devices such as digital mixers and A/D converters. Multiple 1/4" outputs include four independent front-panel headphone jacks, four rear-panel line outs, and two balanced monitor outputs. Additionally, there is one ADAT optical output and a S/PDIF coaxial 2-channel output. Over 50 real-time effects from guitar amps to vintage compressors can be used during tracking and mixing. The Basic FX Pack enables use of two channel strips, each with two FX instances. During tracking sessions, control recording and monitoring levels via a downloadable app for iOS and Android smartphones or tablets. Antelope Audio FPGA technology powers over 50 real-time effects. Use them within the Discrete 4 EasyPanel for tracking or mixing. These not only sound but respond just like real hardware thanks to the unit's component-based modeling platform. Plug your guitar directly into one of the two the hi-Z enabled inputs and instantly sculpt your tone with guitar amps and cabinet models. Add compression, EQ, and AuraVerb while playing through your preferred amp, cabinet, and microphone combination. Perform and record either with effects or your direct input and process later using the integrated guitar effects. The Discrete 4's console-grade and fully discrete preamps were designed to offer high-end, customizable sound. The powerful Antelope Audio FPGA engine can transform these Accusonic preamps into several classic-sounding units via models of circuitry based on tubes, transformers, and FETs. Both the engineer and the performer can instantly hear the blends of ten different mic preamps without any latency or comb filtering. The microphone source can be recorded with and without Accusonic modeling. This allows the engineer to choose between preamp models during mixing. You can even load AFX presets from other users. Traditionally, interface preamps are comprised of two transistors, which makes them a hybrid between transistors and IC chips. Antelope Audio incorporates a fully discrete design consisting of six accurately matched transistors. Field effect transistors add a touch of warmth to the sound and bipolar transistors keep THD and noise extremely low. The Discrete 4 features Antelope’s 4th generation 64-bit Acoustically Focused Clocking (AFC) technology from the acclaimed Trinity, OCX HD, LiveClock, Pure2, Goliath, Orion, and Zen products. Two word clock outputs allow you to distribute clock to your other digital gear and mic preamps in your setup connected via ADAT and S/PDIF. Discrete 4 has a comprehensive and easy-to-configure monitoring and talkback section. A band can have up to four individual monitoring mixes with FPGA FX included sent to headphones or monitor outputs. The engineer can make custom headphone mixes for each performer. Effects can be included to allow artists to hear sound closer to what will be on the record. Users can create custom presets to easily set up various tracking scenarios in a snap. The front panel features a monitor volume knob and dedicated knobs for each headphone output. Metering is viewable on the front panel display, inside the EasyPanel, and via the remote app. Use the Discrete 4 downloadable remote app to adjust all microphone input levels, talkback levels, and monitoring and headphone volumes remotely. Musicians can control their own headphone volume with their phones and the engineer can check input levels from the tracking room. Box Dimensions (LxWxH) 13.7 x 12.9 x 3.9"